For a review of an earlier version of this show that concludes, "Art exhibits in Madison rarely get this good," click review. Degas was one of the greatest of the Impressionists and a key figures in the development of Modernism. Degas' paintings focus on people, dancers, women getting ready for the day (or night), and running horses; his prints share his interests for the most part: people predominate. Degas was a dedicated print collector (at his death he owned 1700 Daumier lithographs and 1900 prints by Gavarni). He made etchings, for the most part, from live subjects, sketching with an etching needle on a copperplate, and printed to please himself. Most of his prints are known only because after his death, his dealer, Ambroise Vollard, printed editions of 150 from the cancelled plates found in his studio. His prints are wonders of spontaneity. A spate of recent shows at the Boston M.F.A. and the Clark Institute have reminded us again of his powerful influence on his contemporaries (especially Forain) and those who followed after, especially Picasso. 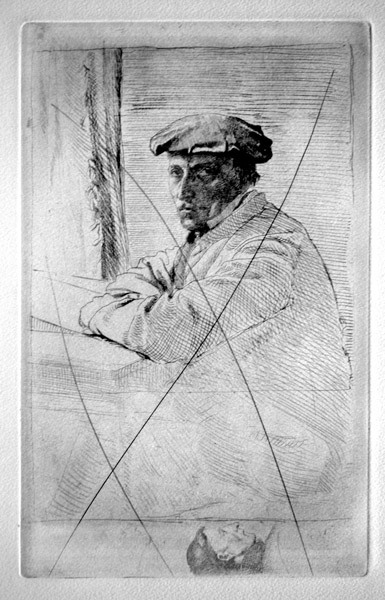 In fact, for Picasso's etching, Degas in the Bordello, see http://www.spaightwoodgalleries.com/Pages/Picasso.html . In this late work from the Series 156: 95, Picasso pages tribute to Degas' ability to be an observer without being a participant, perhaps the opposite of Picasso himself who was anything but an "unmoved mover." Selected Bibliography: Jean Adhemar and Françoise Cachin, Degas: The Complete Etchings, Lithographs, and Monotypes (London: Thames and Hudson, 1974); Loys Delteil: Le Peintre-Graveur Illustré: Volume 9: Degas (Paris, 1919); Sue Welsh Reed and Barbara Stern Shapiro, Edgar Degas: The Painter as Printmaker (Boston: Museum of Fine Arts, 1984). Self Portrait (MFA 8: 4 states , Delteil 1 5 states, Adhemar 13). Original etching, 1857. 11 proofs from the four states before cancellation. After Degas' death. Vollard published an edition of 150 impressions from the cancelled plate. Ours is an impression from Vollard's edition (c. 1919-20). 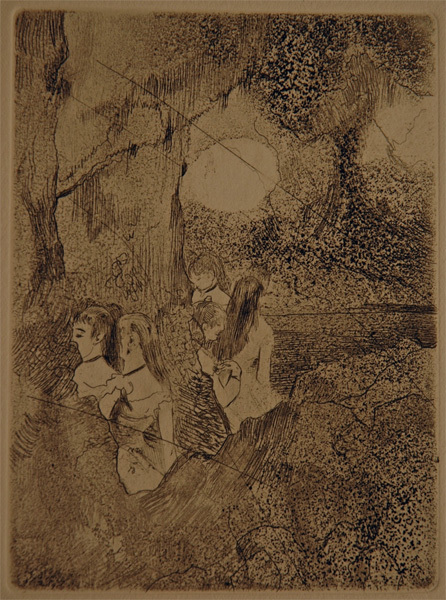 Degas' etchings are extremely rare, and there has been constant demand for Vollard's edition. Image size: 231x144mm. Price: SOLD. Le sportsman montant son cheval / The sportsman mounts his horse (MFA 3, D. 9 v/v, A. 3 v/v). Original soft ground etching, drypoint, & roulette, 1865. The MFA identified 4 proofs from the 1st and 2nd states and borrowed a proof from the cancelled plate from the Metropolitan Museum of Art for their exhibition of Degas' prints. The MFA said they were unable to locate any examples of the 3rd, 4th, and 5th states. Degas had already begun to obliterate the horse in the foreground; the area is partly burnished and marred by a series of vertical scratches. Our proof has ink on the edges of the plate. Rare! After Degas' death. Vollard published an edition of 150 impressions from the cancelled plate. Ours may be a trial proof for Vollard's edition (c. 1919-20) which, like ours, was printed on cream, heavy weight, heavily textured, wove paper. No attempt has been made to hide the cancellation marks, which are not too obtrusive, and the image shows lots of detail. Degas' etchings are extremely rare, and there has been constant demand for Vollard's edition. Image size: 83x75mm. Price: $3500. Madame Nathalie Wolonska, State I (MFA 11, Delteil 7, Adhemar 14). 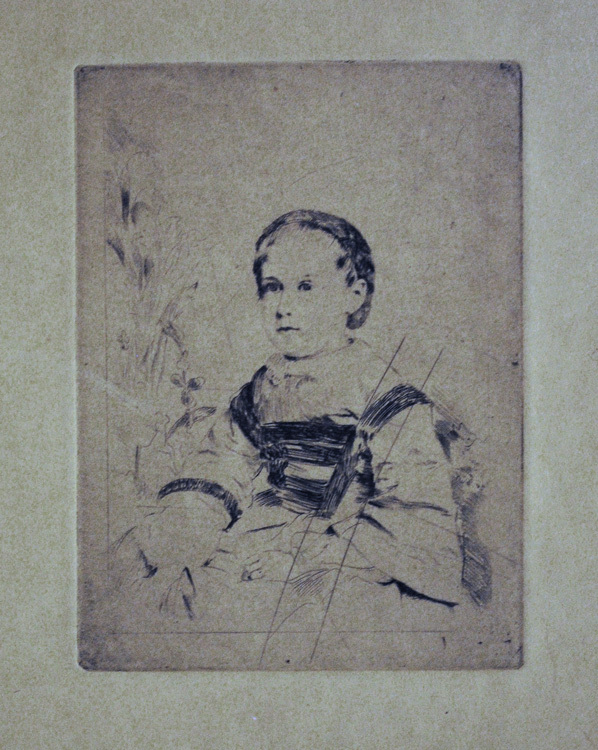 Original etching, c. 1860-c. 1867. There exist only 2 proofs before the plate was canceled. 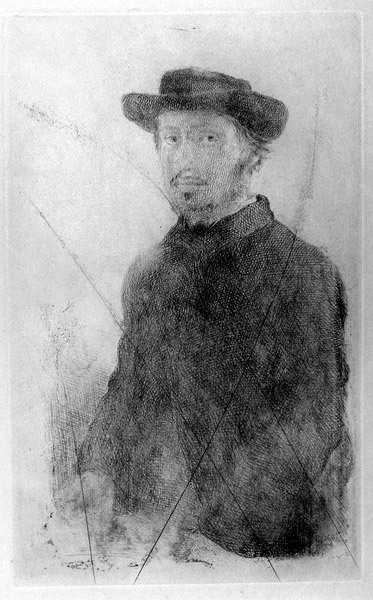 After Degas' death, Vollard published an edition of 150 impressions on what appears to be japon nacre paper from the cancelled plate. Ours is an impression from Vollard's edition (c. 1919-20). Madame was the godmother of Degas' niece. In 1860, she was living in Paris. It has been suggested that Degas may have been working from a photograph (a daguerreotype). Degas' etchings are extremely rare, and there has been constant demand for Vollard's edition. Image size: 119x87mm. Price: $2500. Buste de femme (MFA 44, Delteil 45, Adhemar 5). 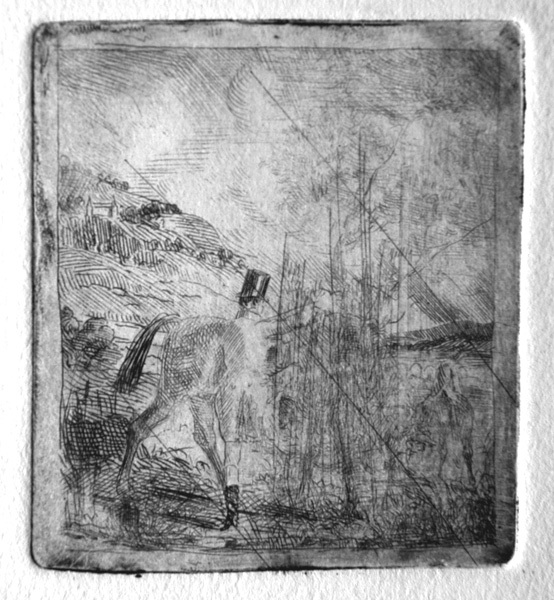 Original softground etching, c. 1856. Edition unknown. 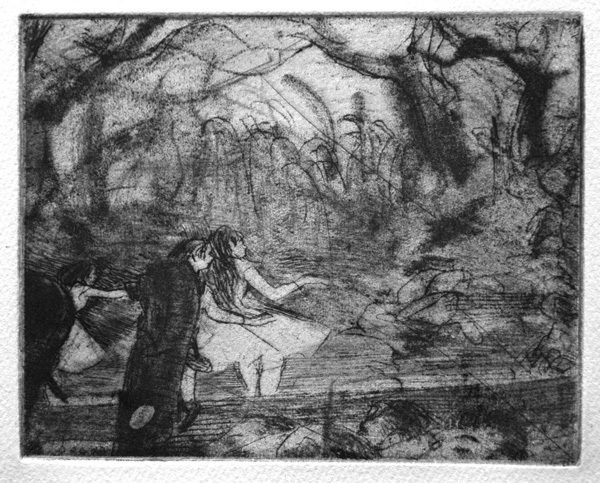 After Degas' death, Vollard published an edition of 150 impressions from the cancelled plate. Ours is an impression from Vollard's edition (c. 1919-20). Degas' etchings are extremely rare, and there has been constant demand for Vollard's edition. Image size: 81x72mm. Price: SOLD. Dancers in the wings (MFA 47: 8 states, Delteil 26, Adhemar 28). Original etching, aquatint, and drypoint, 1879-1880. 20 proofs from the first 9 states. After Degas' death. Vollard published an edition of 150 impressions from the cancelled plate. Ours is an impression from Vollard's edition (c. 1919-20). Degas' etchings are extremely rare, and there has been constant demand for Vollard's edition. Image size: 140x104mm. Price: SOLD. On the Stage III / Sur la scène III (MFA 24: 5 states, D. 32, A. 26 v/v cancelled plate). Original soft ground etching, drypoint, & roulette, 1865. The MFA identifies 6 proofs from early states and an edition of of c. 150 impressions for a catalogue published by Les Amis des Arts de Pau. After Degas' death. Vollard published an edition of 150 impressions from the cancelled plate. Ours is an impression from Vollard's edition (c. 1919-20) printed on cream, heavy weight, heavily textured, wove paper. No attempt has been made to hide the cancellation marks, which are not too obtrusive, and the image shows lots of detail. 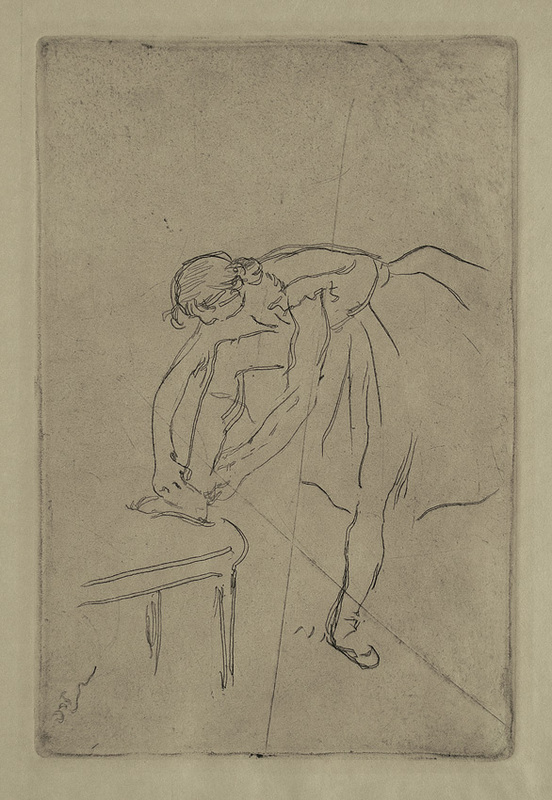 Degas' etchings are extremely rare, and there has been constant demand for Vollard's edition. Image size: 99x125mm. Price: SOLD. Danseuse mettant son chausson / Dancer putting on her shoe (MFA 55 [c. 1888]: 2 states, Delteil 36 [c. 1890], Adhemar 60 [c. 1892]). Uncanceled impressions: 4 proofs. Adhemar suggested that this was possibly intended as an illustration for G. Lecomte's L'Art Impressioniste (Paris, 1892), but in any event it was not included in the volume. After Degas' death. Vollard published (c. 1919-20) an edition of 150 impressions from the cancelled plate, from which our impression probably comes. Sometime after that, another edition in which the cancellation marks were masked so that they didn't print, was attempted but not carried out. 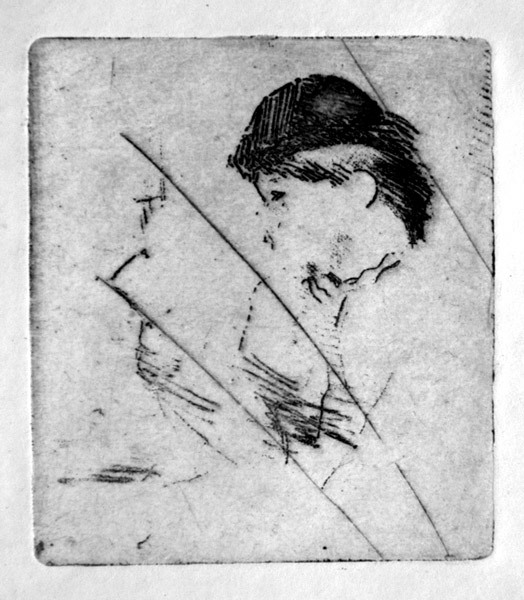 Sue Welsh Reed and Barbara Stern Shapiro, Edgar Degas: The Painter as Printmaker, suggest that "Degas probably used a double-pointed steel pen to cut through the ground, producing distinctive dual contour lines. A few trial strokes appear at the lower left" (MFA, p. 204). 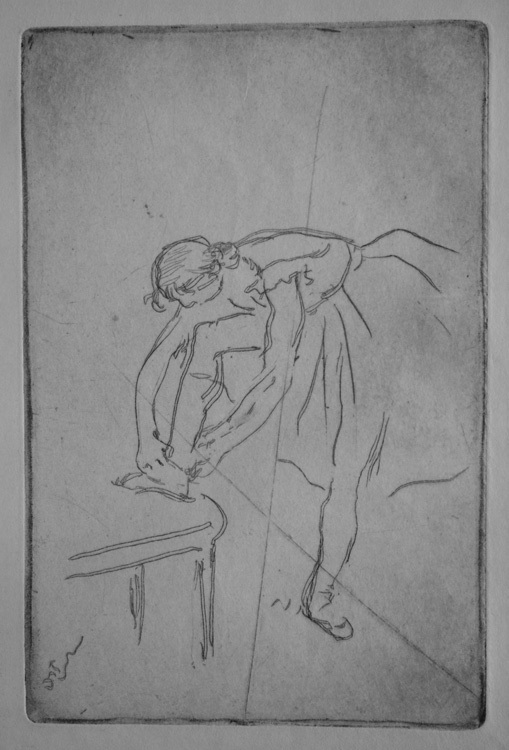 Our impression appears to be an early impression on thin parchment-like paper with the lines still strong and sharp, perhaps a late 19th-century proof before Vollard's edition of this print: in short, a very good impression of this print that arouses desire in the hearts of all ballet dancers! Degas' etchings are extremely rare, and there has been constant demand for them. Light toning just outside the platemark. This is the best impression of this print we have ever seen outside a museum. Image size: 178x117mm. Price: SOLD. Danseuse mettant son chausson / Dancer putting on her shoe (MFA 55 [c. 1888]: 2 states, Delteil 36 [c. 1890], Adhemar 60 [c. 1892]). Uncancelled impressions: 4 proofs. Adhemar suggested that this was possibly intended as an illustration for G. Lecomte's L'Art Impressioniste (Paris, 1892), but in any event it was not included in the volume. After Degas' death. Vollard published (c. 1919-20) an edition of 150 impressions from the cancelled plate. Sometime after that, another edition in which the cancellation marks were masked so that they didn't print, was attempted but not carried out. Sue Welsh Reed and Barbara Stern Shapiro, Edgar Degas: The Painter as Printmaker, suggest that "Degas probably used a double-pointed steel pen to cut through the ground, producing distinctive dual contour lines. A few trial strokes appear at the lower left" (MFA, p. 204). Ours is a good impression from Vollard's edition of this print that arouses desire in the hearts of all ballet dancers! Degas' etchings are extremely rare, and there has been constant demand for them. Image size: 178x117mm. Price: SOLD.